With the increasingly widespread market notebooks and mobile devices these days, makes a lot of vendors are starting to turn their attention to the production segment of this one. 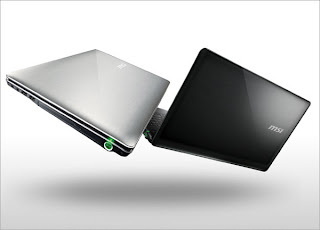 As with most other PC suppliers who have switched their production segment, Micro-Star International, better known by MSI was reportedly now has some kind of notebook besutannya own. And the latest mainstream notebook recently released including MSI MSI CX640 and CR640. Because there is no problem caused more chipsets, then the notebooks are based on the support of Sandy Bridge processor series is now a growing number of launched and marketed. Similarly, MSI and MSI CR640 CX640 which has now become the center of attention and publicity as the start scrolling in the North American market recently. This mainstream notebook itself has been supported by the existence of an Intel Core I3-2310M (2.1 GHz, 3 MB Cache) and 4GB of RAM berkapsitas. A paired GPU is NVIDIA GeForce GT500M even-Series (CX640 MSI) and Intel ® HD 3000 (MSI CR640). Both equally display HD panel (1366 x 768 pixels) with a diagonal of 15.6 inches. While the other features that helped equip them with a capacity of 500 GB hard drive on every model, Gigabit LAN, Built-in 802.11b/g/n WLAN, multi-card reader and USB 3.0 ports and so forth. "We listened very carefully input from consumers Us, and We know that anticipate and address their needs is critical to success in the PC industry", said Andy Tung, vice president of sales for MSI in the United States. "Model CX640 and the CR640 provides a standard element of people in search of a PC that is performance, price, features and design. And for that, we also have gone further. The units incorporate features that respond to concerns in real life most people are like data backup, hard drive protection, and so forth. And we fully believe that consumers will respond later this consideration ". Which may be noted here that the MSI technology Time Stamp can perform backups with just one touch and to restore them by just pressing the Time Stamp that exist. While the technology Fast Boot also presented, which means that existing units can boot two times faster than normal.